Project management is an increasingly diverse field. Individuals across industries, and with varying levels of experience, are providing a substantial impact to its growth and continued evolution. Thought leaders in project management have strong social media followings, are published authors, and are working as leaders for innovative companies and enterprises in the project management industry. We took each of these elements into consideration when developing our list of the 18 most influential people in project management. These 18 project management professionals, in particular, have established themselves as thought leaders and influencers. Together they provide a great body of knowledge to those seeking to become project managers, and working project managers seeking continuing education, alike. So, without further ado, here is our list of the 18 most influential people in project management (in no particular order). Elizabeth Harrin is the founder of the well-known project management website the Girls’ Guide to PM, which receives over 50,000 monthly views and is a fantastic resource for all things project management. She has written five books on project management including Communicating Change, Collaboration Tools for Project Managers, Handbook of People in Project Management, Shortcuts to Success: Project Management in the Real World and Customer-Centric Project Management. Ms. Harrin is currently the Programme Manager for U.K.-based Spire Healthcare Group, and is the CEO and founder of the Otobos Group, an organization that provides project communications to individuals and businesses across multiple industries. Brett Harned is the founder of the Digital PM Summit, the Director of Education at Team Gantt, and a well-known host of project management podcast, “Sprints and Milestones.” Mr. Harned founded the Digital PM Summit as a place for digital project management professionals across industries to meet once a year to discuss big ideas and developments relevant to the project management world. The 2019 incarnation of the summit will be in Orlando, Florida from October 20-22. Brett also authored the book Project Management for Humans: Helping People Get Things Done, which has a perfect 5-star rating on Amazon. Jason Westland is the founder and CEO of ProjectManager.com, an award-winning, industry leader in project management software solutions. Originally from Auckland, New Zealand, Mr. Westland is the author of multiple project management publications, including: Building High Performing Teams, Step-by-Step Project Planning, Managing Projects of All Sizes, The Project Management Life Cycle. He has also written articles for a wide variety of print publications and websites. Susanne Madsen is the author of several books on project management and leadership, including The Project Management Coaching Workbook and The Power of Project Leadership. She’s also the director of the London-based Project Leadership Institute, which works to build well-rounded and dynamic project management leaders. Ms. Madsen’s Twitter account is a must-follow for project management information and continuing education, and her thoroughly researched and engaging writing on the industry has previously appeared on our blog. Lindsay Scott is the director of Manchester, UK-based PMO Learning Limited which is dedicated to helping PMO professionals get the most out of their careers with training and organizational development opportunities. Her clever Twitter account (@projectmgmt) has a devoted following of over 12,000 followers who comment consistently and engage with the content she shares. Ms. Scott is also the director of programme and project management recruitment for Arras People, a recruiting agency that provides talent across the UK in project and program management. Robin Kwong is the head of digital delivery for the Financial Times, where he writes extensively on the convergence of project management and journalism, with articles such as “Why Editors = Project Managers” and “Why Newsrooms Need Project Management.” His unique perspective is a must-read for people interested in how traditional project management techniques can actively be applied to industries like publishing that are in flux and changing with our constantly evolving business climate. Mike Cohn is a well-recognized author and expert on agile and Scrum project management topics, and the owner of a large and engaged Twitter account with over 42,000 followers. Mr. Cohn is the founder of Layfayette, Colorado-based agile software company Mountain Goat Software that consults with major enterprise clients including Adobe, LinkedIn, Southwest Airlines, Google, Intuit and Oakley on their agile and Scrum practices. Bernardo Tirado is an industrial psychologist and Six Sigma Black Belt, with an impressive verified Twitter following of over 48,000. Mr. Tirado is the founder of New York City-based The Project Box, which provides performance consulting to businesses across the project management, sales and social media industries. Project Box’s clients include well-known companies like the Project Management Institute (PMI), Accenture and Psychology Today. He currently serves as the executive director and head of global business solutions for J.P. Morgan Chase. Michael A. Kaplan is one of the most influential people of “Project Management On Twitter” (#PMOT) with over 275K active and engaged followers. Mr. Kaplan is a senior project manager at Illumio, a Silicon Valley-based computer security company that specializes in micro-segmentation and data center/cloud computing security. He has authored multiple articles on project management and leadership which have been published in major publications. Jennifer Bridges is the founder of PDUs2Go an Atlanta-based company that provides easy access to courses for professional project managers to earn Professional Development Units (PDUs) online as needed. Ms. Bridges also is a highly influential YouTube personality who has created hundreds of videos on project management and leadership which have earned well over 10 million views since 2011. Pawel Brodzinski is CEO of Lunar Logic, a Warsaw, Poland-based strategic management and business services company that provides UX consulting, business services, and web development consulting and services. He writes consistently on his blog about software development and lean, Kanban and agile development principles. He also has over 4.8K engaged Twitter followers. Johanna Rothman is the founder of Massachusetts-based Rothman Consulting Group Inc., which provides management and project consulting for executive leaders across industries. Rothman is the author of 14 books, nine of which are on project management topics, including: Create Your Successful Agile Project: Collaborate, Measure, Estimate & Deliver, Agile and Lean Program Management: Scaling Collaboration Across the Organization and Predicting the Unpredictable: Pragmatic Approaches to Estimating Cost or Schedule. Jon Terry is the co-founder of LeanKit, an enterprise software company designed to serve engineers, and currently serves as the chief evangelist for lean & agile strategy for London, UK-based Planview. Ron Rosenhead is an internationally-known project management speaker and author of books including: Strategies for Project Sponsorship and Deliver That Project. He currently serves as the managing director of London-based Project Agency, which provides practical project management training and project management support to companies across industries. His blog is packed full of great project management resources and is worth a daily read. Lew Sauder is the author of three books on project management, including Consulting 101: 101 Tips For Success in Consulting, Project Management 101: 101 Tips for Success in Project Management, and The Reluctant Mentor. He also blogs actively on project management topics. Mr. Sauder is the delivery director for Chicago-based 10th Magnitude, which helps businesses transform business and IT management through use of Microsoft Azure products. Steve Denning is the author of four books on Leadership including The Age of Agile, The Leader’s Guide to Radical Management, The Leader’s Guide to Storytelling, and The Secret Language of Leadership. Mr. Denning’s massive 21K Twitter following is highly active and engaged, and leads to discussions on project management, specifically agile, that are worth reading and following. Esther Derby is the founder and president of Duluth, Minnesota-based Esther Derby Associates Inc., a corporate productivity and efficiency consultancy that works with business of all sizes and industries. Ms. Derby has published over 100 articles on project management in a variety of publications, and is the author of two books: Agile Retrospectives: Making Good Teams Great and Behind Closed Doors: Secrets of Great Management. Her active and interesting Twitter account has over 20,000 followers and is focused on programming and project management topics. Adriana Girdler is the president and chief efficiency officer at Toronto, Canada-based Cornerstone Dynamics, a business efficiency and productivity consulting firm. Ms. Girdler has been published over 30 times in publications including The Huffington Post, Sparkshift and Women of Influence, on project management and productivity topics and also manages the MyVisualVision project within Cornerstone Dynamics, which helps people to visualize their purpose and work toward it. Ms. Girdler has also been featured on several TED talks around Canada, and has a highly engaged Twitter following of almost 12K followers. 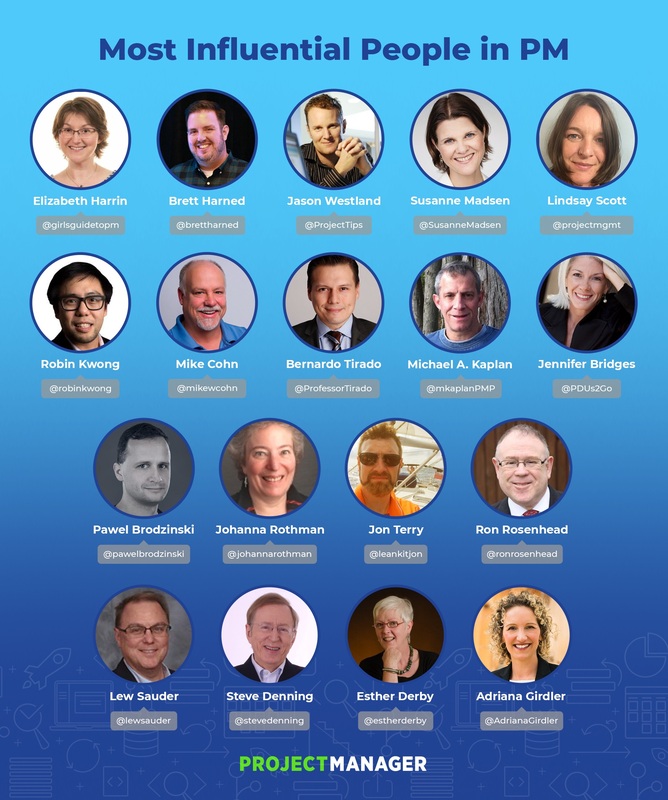 Each of these project management influencers reached the pinnacle of their profession through a combination of thought leadership, online presence and using the right tools to get the job done every time. ProjectManager.com is a cloud-based software that features everything you need to manage your project, regardless of the methodology you apply. Try it free today with this 30-day trial.